The first rule for the runner moving from the road or track to the trail is simple: Lose your watch. The best way to ruin a trail run is to try to quantify it the same way you would a road run. If you want to record your totals, at least switch the screen to show the time of day and turn off all notifications. Road or treadmill runners tend to evaluate each run by two numbers: distance and pace. We may give a bit of allowance for a hilly route or a hot day, but not much. A slow pace means either we were lazy or that something is wrong, and both affect not only our assessment of the run but also our self-esteem. 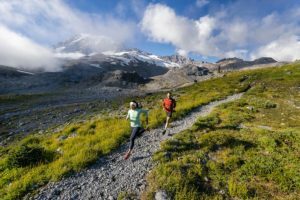 Trail running doesn’t follow the same rules. The terrain and footing on a trail are so variable average pace has little correlation to effort or training effect. Trying to compare a trail run with other runs is an exercise in futility. Looking at my Strava feed from a year ago, for example, one run jumps out at me: 5.2 miles in 1:09:17—a 13:20 average pace. My first reaction is that surely something is wrong; I couldn’t have run that slowly. Looking at the detail, however, I recall that not only was it indeed five minutes slower per mile than the runs around it, it was also one of the tougher runs of the week. What’s more, the heart-rate graph reveals that the first two miles, covered in 21 and 14 minutes, required the greatest effort. What is hidden in the summary of average pace is that in those first two miles I climbed straight up a switchback trail on a Boulder mountain in pre-dawn winter darkness with a local group. Had I been able to see my watch, I would have undoubtedly blanched at the pitiful showing. 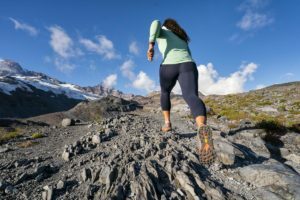 Had I been concerned about the average, I would also have balked at the walking we did—even though my heart rate continued to climb—and resented the minutes standing on the summit watching the spectacular sunrise. The fact is, however, that even though I averaged 13:20/mile, it was a solid hour-long run that left my legs somewhat sore, as if I had run at tempo pace. The numbers didn’t reflect the effort. If we can’t use pace, how do we then compare these miles to our road, track and treadmill workouts? We don’t. It doesn’t compare; it is a different activity. And it doesn’t matter. We must trust that trail running will improve our stride, build strength, reduce the chance of injury, and, in the end, make us faster. Those long-term benefits, however, are just an added bonus to what stepping off the pavement provides. A trail forces you to react to the demands of the moment. Every section requires its own pace, skill and focus. The task is, “How do I run best here and now” — freeing us from the long-range view and external measurements that can tie us into knots of expectations. What’s more, when your mind can’t wander or you’ll fall on your face, it keeps you in the present, not planning your next meeting or mulling the latest relationship conflict. Settling into trail running requires that you pay attention rather than dissociating from the activity and your surroundings. And paying attention is its own reward. It’s a chance to notice the texture of pine needles underfoot, to appreciate the friction of the sloping side of a boulder as you dance across it, or to marvel at how hard you are breathing yet still able to grind up a steep slope that never seems to end, and to celebrate the view that emerges at the top. 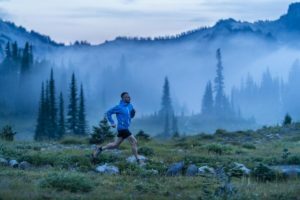 The run ceases to be all about the results or effect, and instead becomes a chance to remind ourselves that we are creatures of the wild outdoors, not machines cranking out numbers. Note, this focus isn’t necessarily better than chasing goals and times—there is a time and season for quantification. When we drop in to a trail run, sometimes the experience goes beyond just enjoying the environment. We get lost in the flow. Trails can alter space and time. You can enter a trail, spend what feels like an hour blissfully wandering, and emerge only 20 minutes later. On another day, you can immerse in the backcountry and escape to another dimension where two or three hours disappear in what feels like a few focused minutes. Embrace the chance to step away from the clock and the grid. Don’t always fit running into your life, sometimes give yourself over to an open-ended run where you don’t know how long or how far or where you’ll end up. When you come to a fork in the trail, take the one less travelled, especially if you don’t know where it goes. Don’t panic if you actually get lost—you’ll find your way back eventually, and you don’t have a deadline. To avoid losing your job or significant other, these runs have to be scheduled, of course. But leaving the return time open whenever you are able can give you a big get-out-of-jail-free card. The more we can lose ourselves in the experience, eliminating stress, self-consciousness and judgment, the more likely we’ll find a new, gratifying sense of self. Quite a big promise for turning off the road and dropping into that little path you run by every day.